You hate seeing your sweet pup in pain. 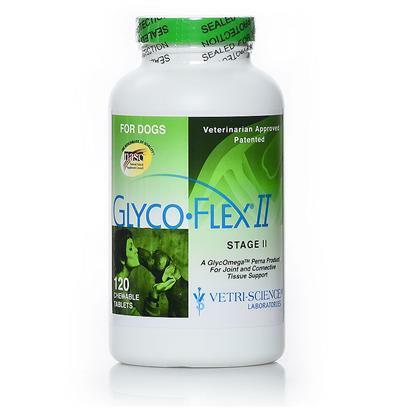 Help ease joint aches and dysfunction with GlycoFlex II. Whether your dog is recovering from surgery or simply has weak joints, GlycoFlex II helps their body heal connective tissue. The formula contains an array of nutrients, including polypeptides and amino acids. It is also quite effective on aging pets. This product gives pets comfort if they are suffering from moderate degeneration of the joint tissue. GlycoFlex II is trusted among pet owners whose dogs participate in a variety of outdoor adventures, such as hunting or vigorous sports. For dogs only. No known side effects. For more information, visit vetriscience.com.